How do you think cars will look ten years from now? How about in 20 or 30 years? It’s fun to imagine how cars will change and what features they’ll have, even if you’re just looking ahead to your own upcoming car purchase. To help you dream about your next car, check out these futuristic technologies that you’re going to want. All of these exist now, but they’re not exactly standard yet. With the growing popularity of hybrids that run on batteries, there’s also increasing demand for ways to make those cars go longer between charges. There are a couple of technologies to accomplish that. 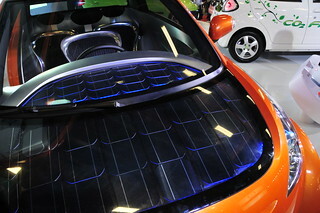 First, you can opt for solar panels on the roof of your Prius. Second, an emerging technology called energy storing panels. Lightweight and efficient, these panels could someday allow hybrids to run on smaller batteries. Without the big heavy battery, the vehicle would be more fuel-efficient. These panels also could capture energy from regenerative braking or build up energy when the car’s plugged in and use it later as needed. Also known as head-up display, this technology places data in front of you on the windshield. It might remind you of scenes from Minority Report or Terminator. In the real-life version of this technology, you may see a digital speedometer and information from other gauges. More importantly, this technology can warn you of a car ahead that’s moving fast enough to run a red light. Because of this feature, this technology is both cool and safety-focused. Best of all, several manufacturers already have this feature in the works, including Toyota, BMW, and Mercedes. Carbon fiber is the wave of the future, in terms of materials used to make cars. It’s lightweight enough to make a noticeable difference in fuel efficiency. As a bonus, one company has figured out a way to make car panels from this material that are interchangeable. The same company hopes to find a way to bring down the cost of carbon fiber. Right now, cars made with this material are very expensive. Right now, technology that incorporates the self-driving concept is available as an add-on feature. For example, you may choose a feature that alerts you when you drift out of your lane unintentionally. There are also cars with self-parking systems. However, truly self-driving cars that take over so you can catch up on work or read your Kindle are being road tested by Google and car manufacturers. If you’re looking to squeeze a few more minutes out of your day, this may be the way to go. Keep tabs on the move toward self-driving cars by following auto news. Similar to the augmented reality displays, the idea is to make it easier to locate and process information from your dashboard. OLED technology is evolving rather quickly, so these cool dashboards could make an appearance as a standard feature sooner than many other futuristic features. What futuristic feature would you most like to see become standard in cars?